Great post! One interesting thing to consider... No mirrors. That means you must rely on the opinion of the people you live with in order to know if you look good or not. What if what was happening was that people dressed and decorated each other? Clothing, beads, etc. would then symbolize relationships between individuals, not individuality. I think good mirrors change everything. It’s one of those things that you probably never thought of, but as soon as it was brought up, it opens a whole new world of questions. The first mirrors used by people were most likely pools of still water, or water collected in a vessel of some sort. 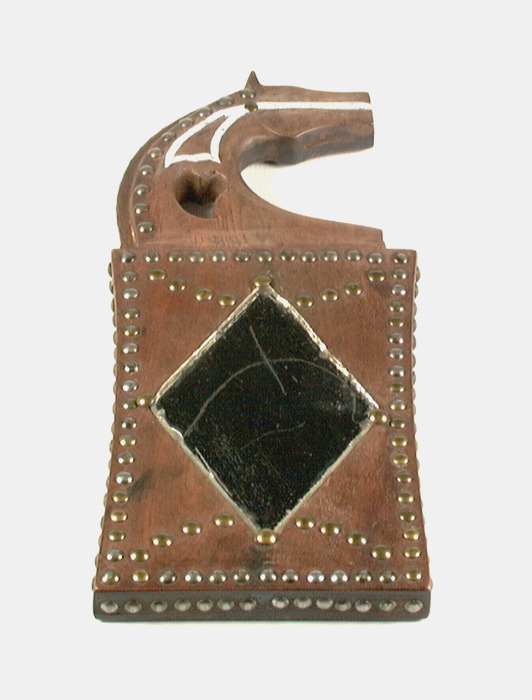 The earliest manufactured mirrors were pieces of polished stone such as obsidian. Examples of obsidian mirrors have been dated back to 6000 BC, and polished stone mirrors from Central and South America date from 2000 BC. Mirrors made of metal, such as polished copper or bronze mirrors, were crafted in Mesopotamia from 4000 BC, in ancient Egypt from 3000 BC, and in China from 2000 BC. Metal-coated glass mirrors are said to have been invented in Lebanon in the first century AD. In the 16th century, Venice, a city famed for its glass-making expertise, became a center of mirror production using this new technique. The invention of the silvered-glass mirror is credited to German chemist Justus von Liebig in 1835. This silvering process was adapted for mass manufacturing and led to the greater availability of affordable mirrors. Which brings us to today. So, basically, reflective devices did exist in the past – for Native North American people, it was probably water found at the edge of lakes, or rain water caught by shallow pools in flat rock formations, or water collected in bowls or pots. Native people incorporated mirrors into their regalia and ceremonial objects, along with sparkling beads and metal tinklers, perhaps to reference the luminous surfaces of great lakes. 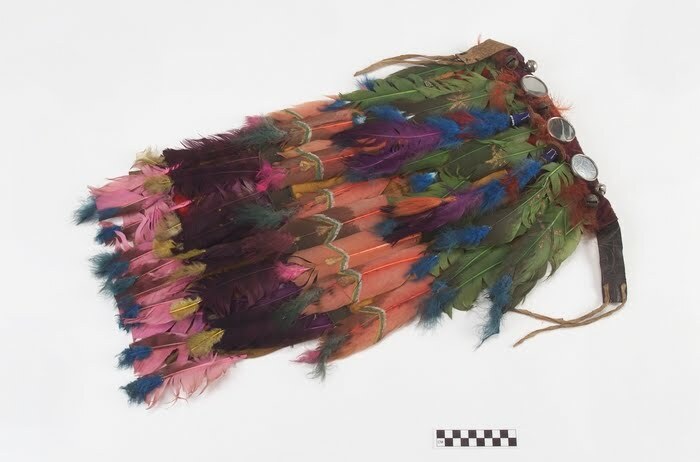 Among the Chippewa, women fastened circular mirrors onto their overblouses or onto men’s vests, and in Oklahoma, the Caddo decorated their dance bustles with mirrors. Interestingly, the base of the Anishinaabe word for mirror is waabi, which translates as vision, sight, or see. In Alberta, a popular lake is named Wabamun (a Cree word meaning mirror). So the connections between mirrors, lakes, and ideas about visions are, well, clear. Historian Bruce White has noted the importance of mirrors as trade goods in an article on Ojibwa and Dakota theories about French merchandise: "Native people appreciated European goods such as beads, mirrors, bells, and caps 'for their aesthetic, magical, or purely decorative and fascinating worth, not their economic value.'" (and this has led scholars to note that these actions were 'a trade in metaphors'). Some suggest that mirrors were used by Native men to send signals by reflecting sunlight – either to communicate vital messages to distant outposts via horseback, or during a dance to send a flirtatious signal to a potential girlfriend. So, a rich history with mirrors does exist in Indian Country, but this trade item was recontextualized into an Indigenous framework. Interestingly, Evans posits that the current prevalence and types of mirrors used today may have changed tribal processes of ‘beautifying’ – from a communal activity to an individual undertaking. In the past, we depended upon family members to dress and decorate us, not the mirror. If this is true, then the objects used for beautification (i.e. beads) take on additional meanings, and they could "symbolize relationships between individuals, not individuality." 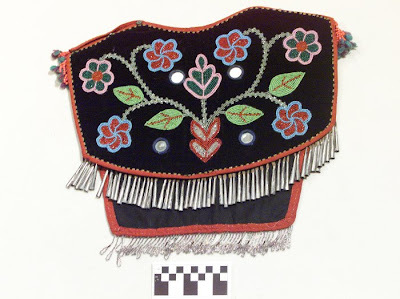 For example, a beaded shirt could symbolize a relationship between a mother and her son, rather than just a man's identity as, say, a warrior. Though times have changed, I think, there are ‘places’ where the communal still reigns. For example, at powwows, you’ll see girls fixing each other’s hair and makeup, and for Pueblo ceremonies the women still get dressed communally. Last summer, my cousin Kristy asked me to be her ‘personal attendant’ for her wedding. She said, “I trust that you and Brandy (our other cousin) will make sure I look beautiful for this important day.” I see this occasion (along with other weddings that take place here) as a form of reasserting the communal – of reinforcing familial ties and the roles and responsibilities that go with it. The idea of mirrors – or more accurately, the concept of beautifying as a communal versus individual process – is an interesting one, and I’m curious if anyone out there has any thoughts to add...? I think the point about the communal is important and it is true that in many traditional contexts it is still important for ceremonial participants to dress each other. Similarly this carries over into non-ceremonial dress for special occasions - when we dress up for a special occasion we may need help fastening, zipping and tying things that we don't normally wear - we ask the opinion of our family members - how do I look? If you care about my race - my appearance is Scottish and Irish - my ancestry is traced to immigration around 1750 - my mothers line intermarried at various points with Choctaw and Cherokee people. I was raised in Tahlequah, Oklahoma. Although I am not an enrolled member of the Cherokee Nation some of my cousins are enrolled. My sister's appearance is completely different her hair is almost black and straight illustrating the diversity of our genetic heritage - I have spent my life working with Native Nations developing Cultural Centers - I appreciate this blog and encourage you to continue the dialogue. These issues of cultural appropriation and cultural identity or not simple - they are complex and sometimes the conversations are painful - but talking is always the first step to understanding. Imago Leather – Get the absolute best deals on handcrafted leather clothing for men, women and kids. Our all products are hand-made with premium natural leather. Get FREE shipping on all stylish leather clothing today.